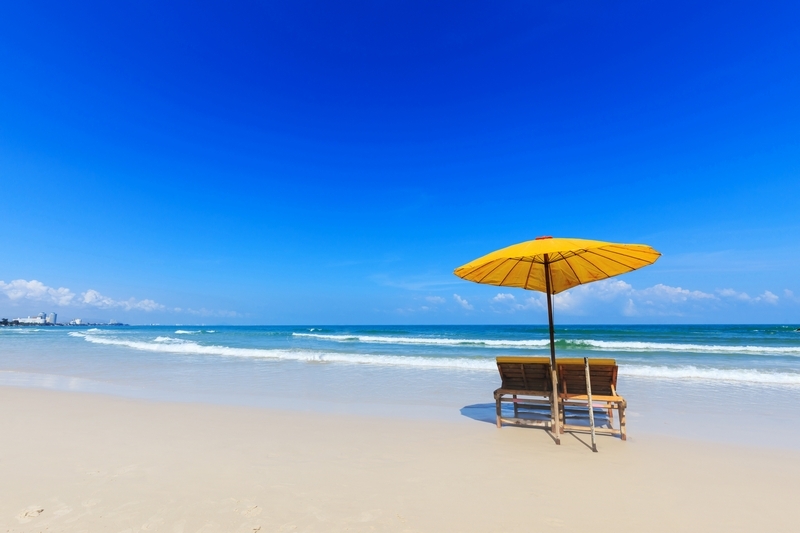 Hua Hin is described as one of Thailand’s top family-friendly destinations. Not only is it highly accessible from Thailand’s capital city of Bangkok, but there’s so much for you and your family to enjoy. It’s home to beaches perfect for an afternoon of lazing in the sun and listening to your children splashing around in the lagoon-like waters. But, if you wanted to tear your family away from the gently rippling waves and sandy coastlines, there are some very exciting activities in the area. You could take a trip to Monkey Island, where your kids can hand-feed an assortment of monkeys including the Mantled Howler, the White-Faced Capuchin and many more. Perhaps you’d prefer whizzing across rocky landscapes on an All Terrain Vehicle (ATV), or you could encourage your child’s inner artist, at the Art Village (just 15 minutes from the centre of town) where artists showcase their talents to an eager audience. You can then try your hand at it in the craft area. One thing’s for sure, there’s no chance of you and your children getting bored in this delightful seaside resort. This is the ideal location for families looking to add a little thrill to their next holiday, with an abundance of adrenaline-fuelled adventures to keep your little monsters entertained for hours. Take them to Samui's Coco and Splash water park, at Lamai Beach. It’s designed for all ages and offers an abundance of high-speed thrills with a selection of seven slides, four pools and there’s even a jacuzzi for when you want to slow things down. 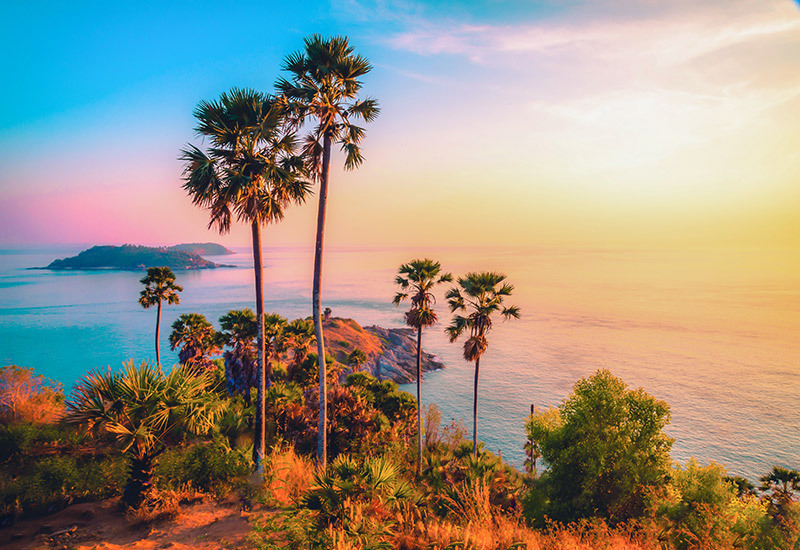 But if you’d prefer to explore Thailand’s natural water parks, you could head to the Ang Thong Marine park, an area made up of 82% water and 42 small islands. It’s home to a vast array of wildlife, including sea turtles, lizards and occasionally people have seen hairy-nosed otters. You and your family could spend hours snorkelling, rock climbing, hiking along nature trails, cave touring and so much more. There are many speed boat companies offering excursions to the marine park from Koh Samui and it’s a great day out for the family. Maybe you’d prefer more traditional activities like go karting. Just off Samui’s Ring Road in Bophut, there’s a 500m track for you and the family to whizz around. Maybe a spot of crazy golf is more your thing, well there’s always Chaweng, with a nine-hole mini golf course. There’s just so much for you and your family to enjoy in Koh Samui. 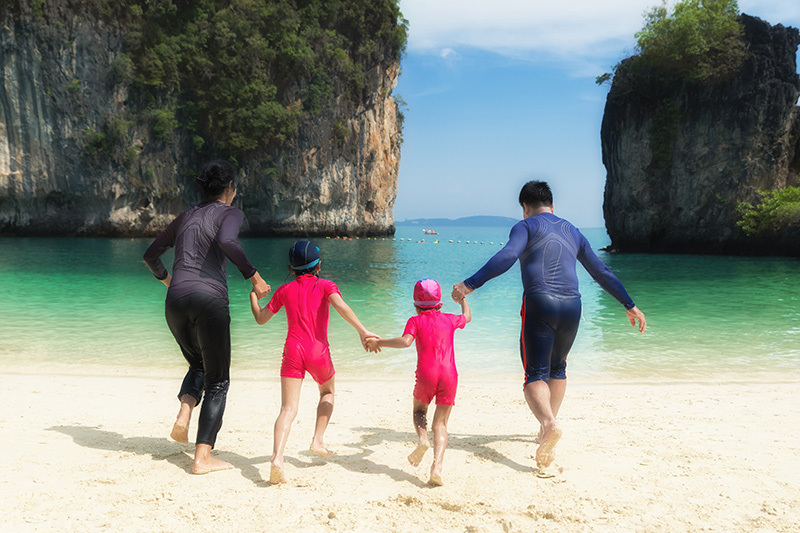 Phuket is the place to exercise your inner-acrobat with an array of activities to get you and your kids jumping and somersaulting. Your youngsters will be ready to pack their bags and run off to the circus in no time, particularly if they partake in the mid-air circus academy. Professional trainers take time to teach people how to fly through the air and master the art of trapeze. Don’t worry if you only have a few days in Phuket, you can still give it a try and its great fun for all the kids. After this, you could try your new-found aerobatics in the 50 FLY! Trampoline Club and enjoy some time on the trampolines, starting from 350 baht per hour and 500 baht for a specialist course. However, if all this jumping around isn’t quite your thing, no problem. You could try something completely different, something you’d never thought of trying before and visit an upside-down house (known as Baan Teelanka). It costs around 341 baht (around £8). You walk around on the ceiling snapping pictures and gazing at the household furniture below. It’s a lifelong, childhood memory waiting to happen. Tip: When in Phuket steer clear of Patong, it’s famed as Thailand’s prostitution capital. 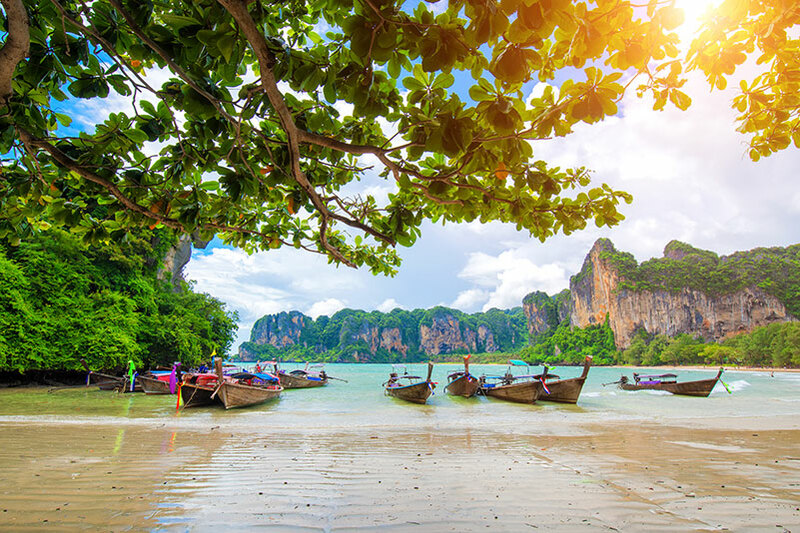 Krabi is the place to take the family and marvel at Thailand’s natural beauty. It’s a great place to try some island hopping. You can explore an estimated 200 islands and islets, just a short distance from the coast. Many are small rocky outcrops that rise from the Ocean with no landing post, but others are larger and uninhabited. 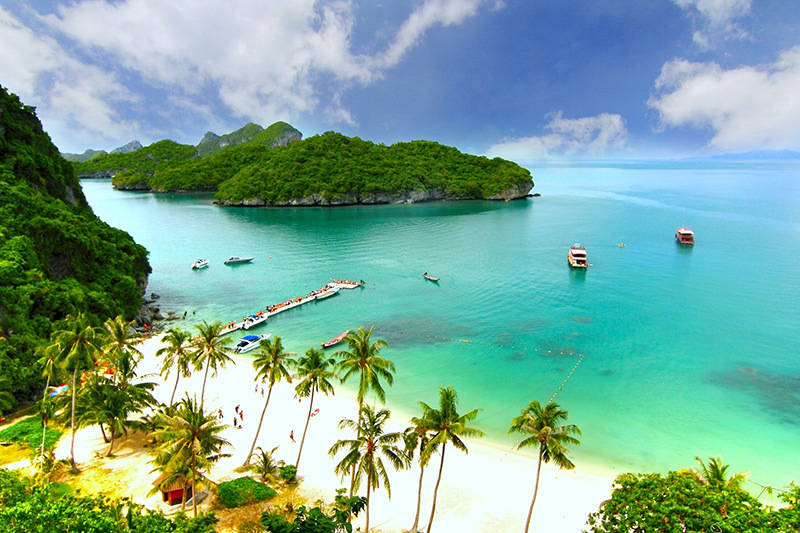 You could join an organised tour, or rent a local boat from Krabi town and try a spot of snorkelling or kayaking. The Thung Teao Forest Park is another natural sight your children will fall in love with and highlights Krabi's famed natural beauty. It’s located about 50km south of Krabi town and it’s home to some striking natural sights including the Emerald Pond, a 2km nature trail and much more. The park is rich in biodiversity making it easy to mistake these surroundings as a paradise on Earth. If you’d like to travel to Thailand and educate your children on the differences between cultures, then head to Chiang Mai, with its collection of sights and activities to teach your children about the highly unique way of life in this part of the world. Throughout the region, many local Thai chefs offer cooking classes to teach you the many culinary delights of Thailand including pad thai, spring rolls and an assortment of curries. But the highlight of a trip to Chiang Mai is the Elephant Nature Park. You and your children could spend the day helping to rehabilitate these graceful creatures by lending a hand with feeding and washing them. It’s great for all ages. 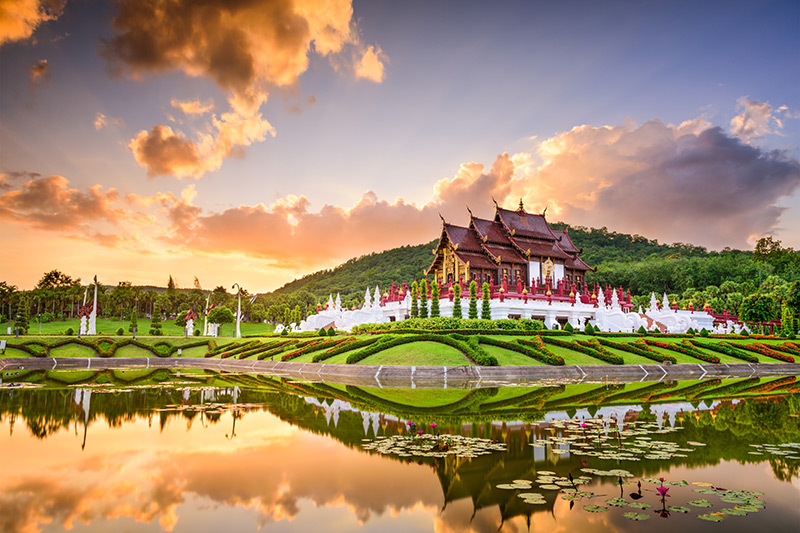 Alternatively, Chiang Mai is home to many temples and culturally significant sights and there’s no better way to get to these than a ride on a tuk-tuk. Still unconvinced that Thailand is a place for families? Well, you could always book a trip and see for yourself. Choose from one of our villas in Thailand.